Perennial, or occasionally annual, herb from slender, fibrous root mass; stems several, ascending to prostrate, but not rooting at nodes, 20-60 cm tall/long, stiff- or soft-hairy or smooth, somewhat hollow. Extremely variable, egg- to heart-shaped, 3-lobed or -parted to pinnate, 2-6 cm long, 2-7.5 cm wide, the leaflets undivided or 1- or 2-times lobed or parted, the ultimate segments linear to circular, margins toothed or entire, smooth or hairy, the stalks 3-20 cm long; stem leaves alternate, shorter-stalked, transitional to the upper linear to oblong bracts. Inflorescence a few- to many-flowered cyme; flower stalks to 15 cm long; receptacle usually smooth; petals 9 to 17, distinct, yellow, oblong to oblanceolate, 7-14 mm long, 2-6 mm wide, nectary on upper surface, the nectary scale smooth, about 0.7 mm long; sepals 5, bent back about 2-3 mm from base, often early deciduous, greenish or reddish-tinged, 4-8 mm long, 2-4 mm wide, soft-hairy; stamens 40-80; pistils 15-40. Achenes, 15 to 40 in a globe-shaped head 3-7 mm long, 4-9 mm wide, the achenes broadly egg-shaped, 1.8-3.2 mm long, 1.4-3.2 mm wide, about 1/3 as thick, usually smooth, margins distinct, slightly keeled; beaks stout at base, lanceolate, curved, 0.2-0.8 mm long. Whittemore (1997) speculated that because no collections of this species had been made in BC before 1978, this species should be treated as an introduction. In fact, our first collection was made on Trial Island in 1952. No earlier plant collections are known from Trial Island, but there is no reason to believe it is a recent arrival on the island. Many other rare native species in the Victoria area were not discovered or did not become well known until collection activities increased in the 1960's. This species forms hybrid swarms with R. occidentalis in our area. Mesic to dry, grassy coastal bluffs and meadows; rare on extreme SE Vancouver Island and adjacent islands; S to CA. "Ranunculus californicus is one of a group of species that are described by Ceska and Ceska (1997, 1999) that occur from California to the Columbia River Gorge, are usually rare or missing in Washington State and then occur on southeastern Vancouver Island. The list of species includes Limnanthes macounii, Allium amplectens, Crassula connata, Dryopteris arguta, Ranunculus californicus, Isoetes nuttallii, Juncus kelloggii, Microseris bigelovii, Montia howellii, Myrica californica, Trifolium depauperatum, Vulpia pacifica, Woodwardia fimbriata, and Triphysaria versicolor." Klinkenberg and Klinkenberg (2003). Klinkenberg, Brian and Rose Klinkenberg. 2003. Stewardship Account for California Buttercup (Ranunculus californicus Benth.). Garry Oak Ecosystem Recovery Team, Victoria. Read the COSEWIC status report. Ranunculus californicus is quite similar in appearance to the common western buttercup, Ranunculus occidentalis; however, the most reliable features for distinguishing between the two species are style length and shape (A. Ceska, pers. comm., 2003; M. Fairbarns, pers. comm., 2005 ). 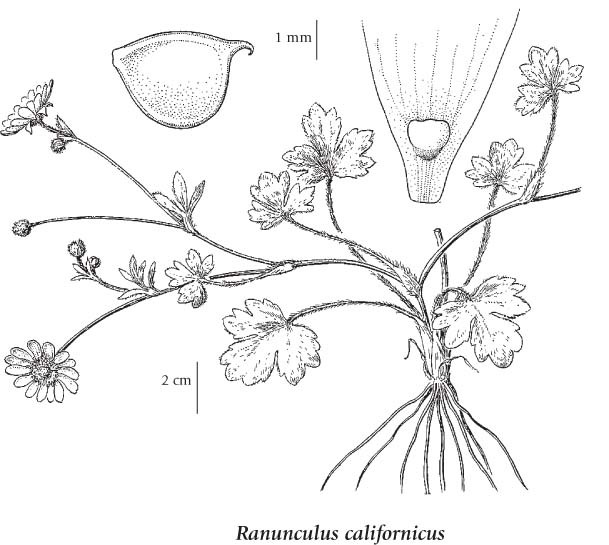 In the literature, R. californicus is reported as being typically many-petalled, while R. occidentalis is usually five-petalled; however, R. occidentalis can have many petals and R. californicus can be few-petalled (Klinkenberg and Klinkenberg 2002). Other authorities suggest that R. californicus has very shiny, almost shellacked-looking petals. Additionally, the taxonomic complexity of the R. occidentalis complex and the presence of hybrid swarms adds to the difficulty of identifying R. californicus (Brayshaw 1989; Klinkenberg and Klinkenberg 2002). Separating hybrids from parents is challenging. Ranunculus californicus var. gratus Jeps.